Here's a quick and easy card using the (now retired) Fast & Fabulous stamp set. It's 2-Step stamping, but the Clear Mount stamps make it so easy to line up, my Stamp-A-Ma-Jig rarely gets any love these days. Lots of items from the new IB&C used on this card! Love this! 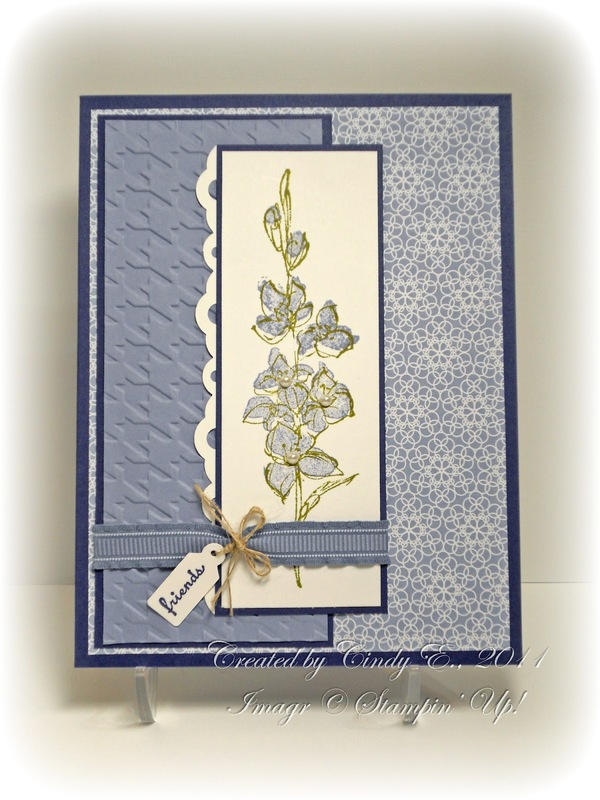 Absolutely lovely use of the Wisteria Wonder! Really cute! Love the great sketch and all the new goodies! Gorgeous card Cindy; can't wait to see all the new products IRL. Thank you for stopping by my blog and for your kind wishes. It is much appreciated. Judy. Such a pretty card. Great details throughout: color scheme, layout, paper and image choices. Lovely! Perfect use of the Wisteria and the floral image! Wisteria Wonder is just perfect for this card. Love the punch peeking out on the edge. Love the houndstooth embossing and the colors you chose.